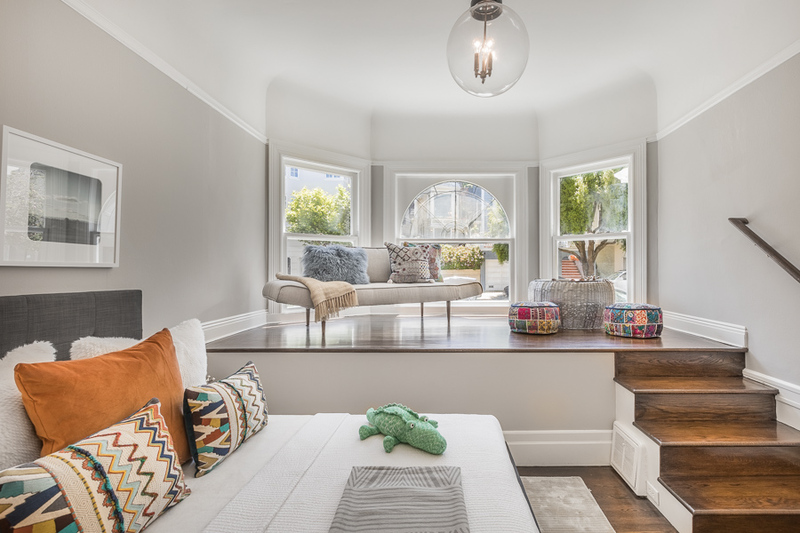 This idyllic two level residence rests on a flat tree-lined street in the heart of Cow Hollow. Upon entering, you are drawn in down the hallway towards the oversized picture window that perfectly frames the views of Angel Island and the Bay. 1970 Green St is appointed with three bedrooms, two and one half baths, approximately 2,230 sqft*, and one car parking. Details include beautiful oak hardwood floors, soaring 10'6" ceilings, classic ceiling medallions, and impressive moldings. The rear of the homes hosts the entertainment spaces, which benefits from the spacious open floor plan and serene bay outlooks, as well as close proximity to the kitchen. Adjacent to the formal entertainment spaces is the family room, complete with a built-in banquet and a timeless brick fireplace, which can be enjoyed from both the family room and living room. The kitchen has been thoughtfully updated with stainless steel appliances, a 6-burner gas range, subway tile backsplash, and incredible storage including a built-in china cabinet and pantry. A private laundry room with a side-by-side washer/dryer is accessed just off of the kitchen. Down the hall, past the dining room, is a convenient powder room, multiple closets, two bedrooms, a full bathroom, and the foyer. The front bedroom is flooded with natural light and includes a large closet as well as a raised flex space overlooking the greenery below. 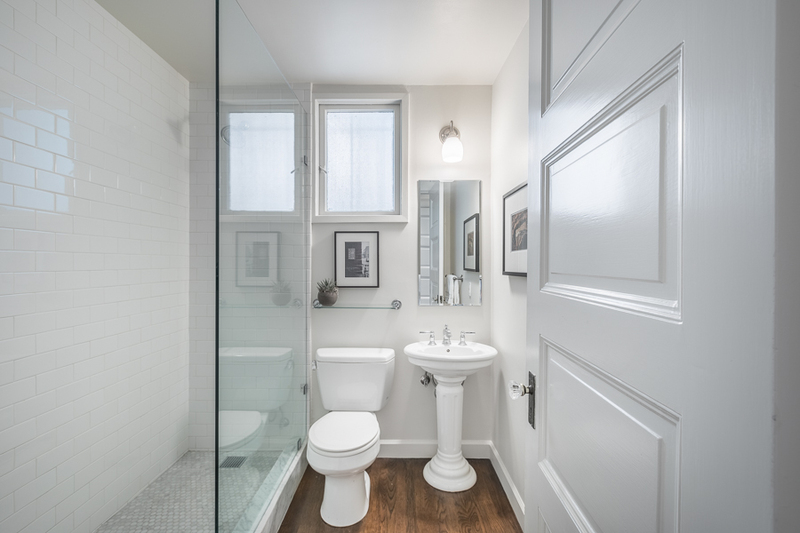 The bathroom has been renovated with a European-style walk-in shower with white marble. 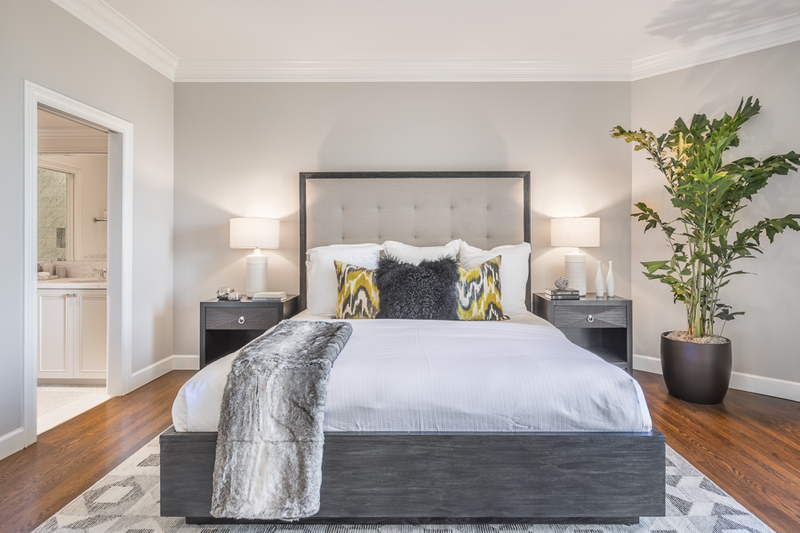 The lower level of home hosts the spacious master suite, which includes a luxurious en-suite bathroom, two walk-in closets, and ample space to accommodate a master lounge. A pair of french doors overlook the garden below and allow for incredible air flow throughout the room. The sumptuous en-suite bathroom is complete with dual sinks, classic white Carrera marble counters and tiles, a soaking tub, and a glass-enclosed walk-in shower. Just off of the master bedroom is a hallway leading to the exclusive garden. The garden is the ideal space to relax and host BBQs or intimate gatherings. 1970 Green Street is part of an intimate two-unit building that was constructed in 1904 and features classic Edwardian details including an impressive arched entry vestibule, dentil molding, and bay windows. The residence includes one car parking, offering interior access into the unit, and additional storage. Perfectly located just one block off of the vibrant commercial corridor along Union St - home to Equinox, Soul Cycle, Belga, Flores, and CA Wine & Cheese, just to name a few.